When you hand out your business card, does it catch the person’s attention? Or do they not give it a second thought and stuff it away in their wallet or pocket? A lot of people have business cards just because they’re supposed to. They don’t put much thought into the cards they choose, and as a result, they have a boring card that doesn’t get results. It’s just a waste of space. The good news is it’s actually pretty easy to come up with a business card that stands out from the rest…one that serves as a powerful marketing tool for introducing yourself to new prospects. You just have to make sure you avoid these 8 common business card boo-boos. 1. Using a generic template — There are hundreds of millions, even billions, of business cards floating around out there. You probably have a few stuffed in your wallet or hidden away in a filing cabinet. These other business cards are your competition. Your job is to stand out from this sea of cards so other people will notice you. You won’t do that if you use the same generic template as everyone else. 2. Not focusing on readability — Now, some people get so carried away in designing their cards that they ignore one tiny thing: Other people need to be able to read the card. Don’t use hard-to-read fonts, and pay attention to the colors you’re using to make sure there’s good contrast. Above all else, someone should be able to read your card easily when you hand it to them. 3. Home-printed business cards — There’s nothing wrong with wanting to save money, but there are times when going cheap makes you look like an amateur. That’s definitely the case with home-printed business cards. Not only is the paper quality usually pretty low, but the cut of the cards isn’t always straight and smooth. Also, it can be easy for the printing to be slanted and uneven on these homemade business cards. 4. 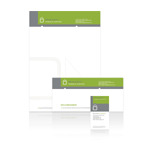 Using cheap paper — Speaking of cheap paper, make sure you choose quality paper stock for your business card. You don’t want a feather-weight business card that tears easily or that can slide out of the wallet. This card is an extension of your brand. Don’t skimp on it. 5. Being unclear about who you are and what you do — You’d be surprised at how many people overlook the basics of business cards. Your card needs to have your company’s name, your name, your contact information, and your title. I also recommend putting your unique selling proposition on the business card to help it reach its maximum marketing potential. Just keep it short and to the point. 6. Too much info — Keep it simple. Your business card shouldn’t look like a mini-book. A cluttered design is distracting, making it difficult to find the info you need fast. 7. Trying too hard to stand out — Yes, it’s important to make sure your business card gets noticed, but you have to make sure you don’t go overboard trying so hard to stand out. For example, don’t use oversized business cards: They don’t fit in most wallets. 8. Misuse of your business card — Some people get business cards, yet they never carry them around or hand them out. You should always have a few of your cards on you, because you never know who you’re going to bump into. On the flipside, you have people who are too eager to hand out their cards. People who are shoving their card in your face while you eat; people who are trying to network at funerals. There’s a time and a place for handing out your card. Know them. Do you like your business card? Why or why not? This entry was posted on Wednesday, May 12th, 2010 at 6:19 pm	and is filed under Business Cards. You can follow any responses to this entry through the RSS 2.0 feed. You can leave a response, or trackback from your own site.